The Russian Naval Fleet is based in Ukraine, much to the dismay of Ukraine. Ukraine however has said it will bar Russian ships which took part in the offensive from returning to their base. You can bet your money on it that the Russians will not be happy. All these new movements follow Georgian President Mikhail Saakashvili singing a cease fire. Vladimir Putin has yet to sign the treaty and will be urged by U.S. President George Bush & E.U. President Nicolas Sarkozy to do so. It seems Russia is willing to do what it takes to take out American ally Georgia and return Georgia to Russian control. Yesterday Russian planes twice hit an area near Tbilisi, the Georgian capital. Nowhere near the front lines. 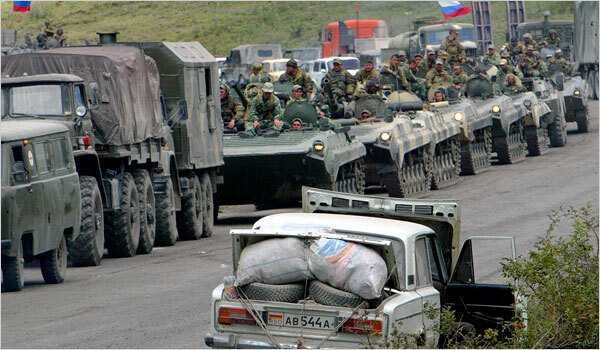 Interior Ministry spokesman for Georgia Temur Yakobashvili said ‘Russian tanks tried to cross from South Ossetia into the territory of Georgia proper, but were turned back by Georgian forces’. He said the tanks apparently were ‘trying to approach Gori, but did not fire on the city,’ According to estimates the Russians have 10,000 soldiers in the country of Georgia which is smaller than South Carolina. Russia issued an ultimatum to Georgian forces on Monday to surrender completely in and around the western pro-Russian separatist enclave of Abkhazia, in a sign that fighting could escalate on a second front in the west of Georgia. It seems now we will all wait. 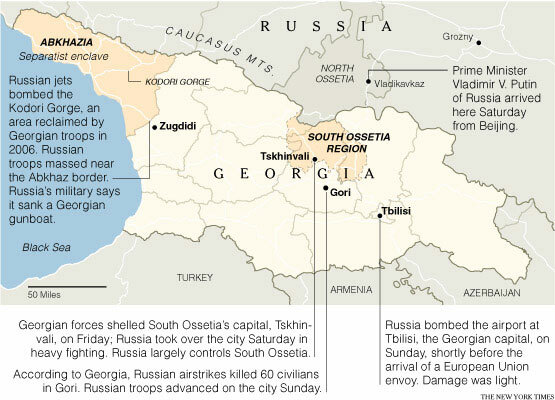 Will the Russians which have poured troops, tanks, and airplanes into South Ossetia and Abkhazia forcing a Georgian retreat end there? Or will the Russians push forward and attempt to take out Georgia itself. If they attempt to take out Georgia, we might see a larger conflict ensue, one which might even bring in NATO. This entry was posted on August 11, 2008 at 11:39 am and is filed under Asia, Europe, International News, War. You can subscribe via RSS 2.0 feed to this post's comments. and what about USA and Kosovo??? it si not simillary?